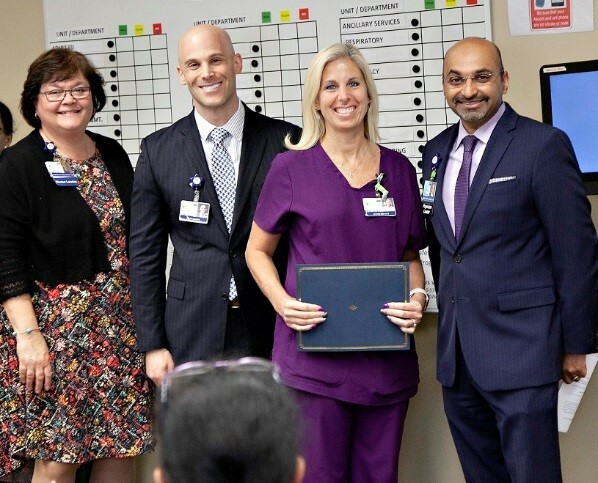 Alexis “Lexi” Bryant received the Howard County General Hospital’s Partner in Pursuit of Organizational Excellence Award on May 7, 2018. Applies best practices to daily work and goes above and beyond to support patient safety and the patient experience. Participates in or leads performance improvement teams at the departmental and/or organizational level to achieve common goals of patient safety and improved patient outcomes. Contributes to a supportive and healthy work environment through teamwork and collaboration. Supports new learning and the use of technology to advance patient safety. I nominated Lexi for the award due to her outstanding work which demonstrates how she truly gives her best every day, and goes above and beyond to support the best patient outcomes in regard to safety and experience. Not only has Lexi as our Blood Bank Lead trained all the medical technologists at HCGH to be competent blood bankers, but she makes herself available to the staff on a 24/7 basis to ensure patient care is not jeopardized. Furthermore, Lexi put together a comprehensive PowerPoint presentation about blood products, administration options, how to order, expiration times, emergency release, massive transfusion protocols, and specimens which should be collected during an MTP for better oversight of how to best handle transfusion needs. She has presented this PowerPoint to many of our physician groups including anesthesiologists, ER providers, intensivists, and OB providers. She also created a trifold quick education guide of all the information from her PowerPoint which the OR, ICU, and ED have displayed in their departments for quick reference and better decision-making for transfusion needs. Alexis is an active member of the Armstrong Community Blood Utilization group, HCGH’s own blood utilization group which meets monthly, and the system-wide Johns Hopkins Transfusion Group of all Hopkins hospitals. Congratulations, Lexi, and much deserved!